As a chef and a father of two I’m always looking for ways to serve healthier and better tasting meals as quickly as possible. 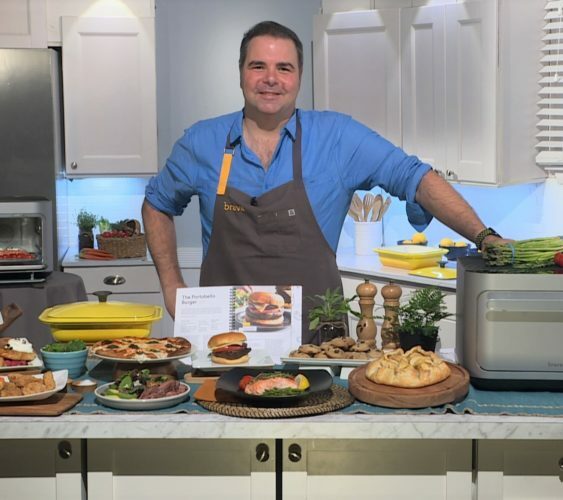 I’ve partnered up today with Brava countertop ovens that use a revolutionary heating technology that’s gonna change the way you cook. The Brava oven harnesses the power of infrared known as Pure Light technology. It’s wicked fast because it has infrared bulbs that fire at different frequencies and directly transfer heat through light energy, convection and direct heat which means super fast cooking and no preheating. In fact, the oven preheat to 500F in under a second! These dishes were taken from the over 300 chef-tested and programmed recipes to help you cook at the touch of a button. That means you find a recipe that you like on their app or website, prep it, place it in the Brava and push the button. The Brava knows exactly what you’re cooking and how long and what temperature to perfectly cook it for. It even has a built in TempSensor thermometer probe to cook meats to your preferred doneness. By the way you can always manually toast, reheat, bake, sear and even air fry in the Brava. So you may be wondering why is there no glass door? Well, this keeps the oven cool on the outside for safety but also super hot on this inside for instant cooking. And the coolest part is that you can still see what’s in your oven while it’s cooking thanks to a built in “oven-cam” that displays a live feed of your food on the touch screen display or better yet directly onto your app! Look at that! Believe it or not you can cook a whole meal on just one pan. Place the different kinds of foods on each zone on the pan and just let the Brava know what you’re cooking. It separately cooks each ingredient on each one of the zones automatically making sure nothing is under or over cooked. For example, I made this salmon on the same tray as the asparagus. The salmon seared and cooked to juicy precision, while the delicate asparagus is still crisp, flavorful and perfectly roasted. And if you’re a parent like me, those frozen nuggets and fries crisp up instantly to feed my “hangry” children. You can make just about anything with it. In fact, my kids often help me bake and make desserts like these chocolate chip cookies or lemon poppy seed bread or how about an apple crostata? All found on the app and perfectly cooked at the press-of-a-button.